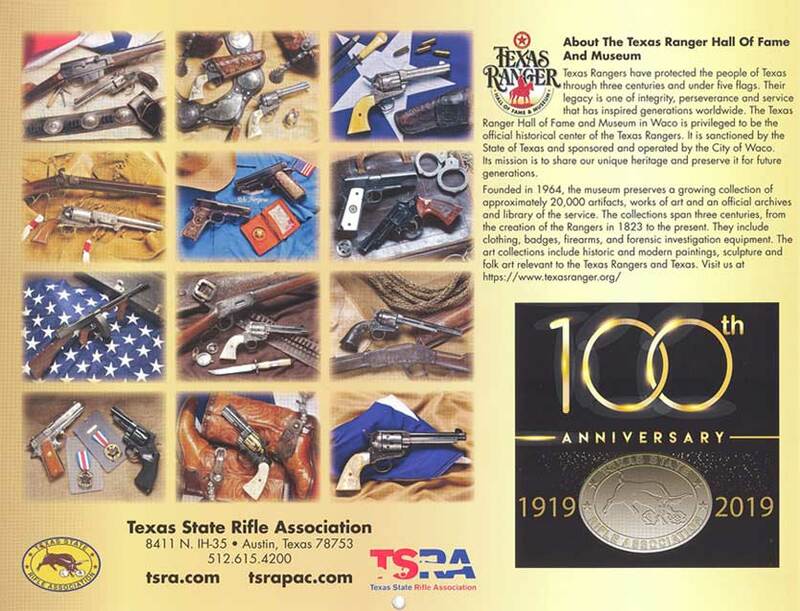 Celebrating their 100th anniversary next year, the Texas State Rifle Association and the TRHFM have partnered together to create this collectible calendar featuring firearms and artifacts from the Museum collections. It was distributed to 35,000 TSRA members. The Association graciously gave us a limited number to sell as a fundraiser for the Museum. 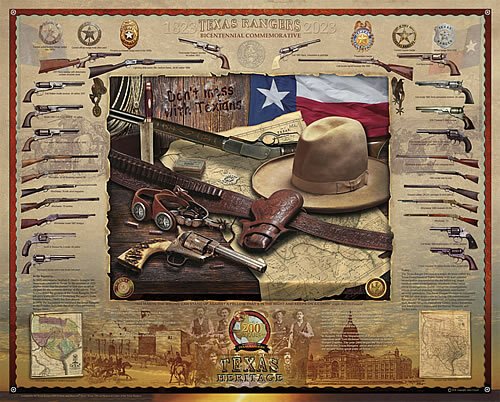 Features firearms and badges from the Texas Ranger Hall of Fame and Museum's collections. This print focuses on the Old West, evoking the Ranging companies and Frontier Battalion. The 24" x 30" prints are signed by the artist. Made in the Texas Department of Corrections. These handmade pistol caddies/pouches are specially made for the Texas Ranger Hall of Fame in the Texas prison system (Texas Dept. of Corrections). 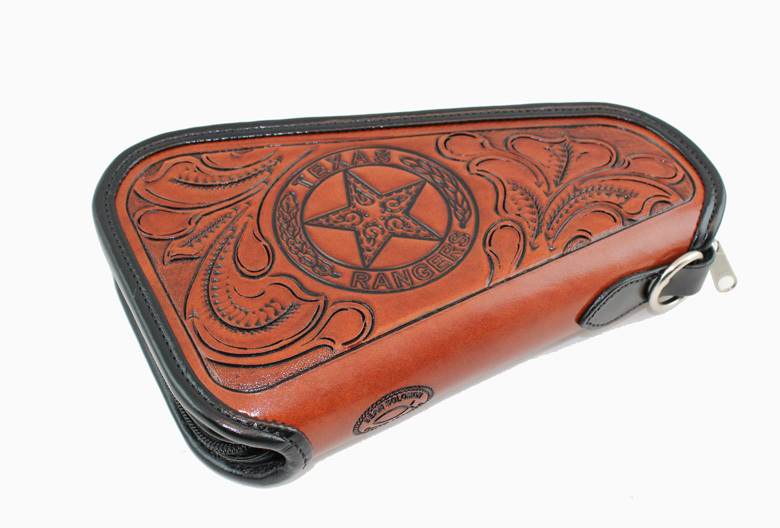 Available in very limited quantities, the exterior is hand decorated heavy-weight leather decorated with a stylized Texas Ranger badge design. The outside dimensions of each caddy are: 12 inches in length by 6 inches in width. The interior dimensions are 11 inches in length by 6.5 inches in width at the center. This caddy will carry the most popular standard pistols and revolvers today, in addition to many antique pistols, up to about 10.75 inches in overall length and 6.25 inches tall at the grip. 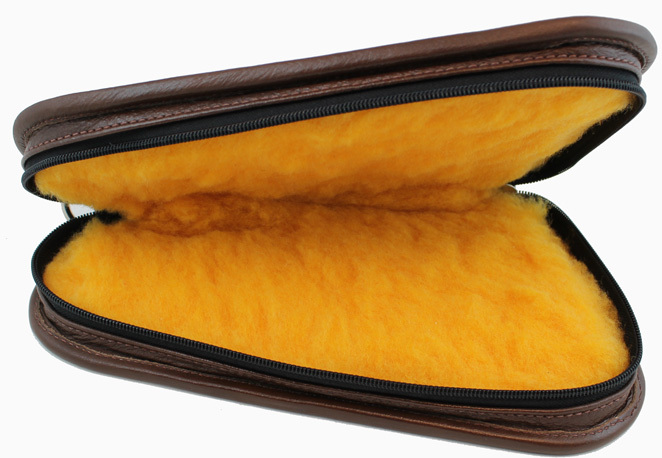 The case is fleece lined and has a zipper and D-ring that can be secured with a combination or keyed lock. 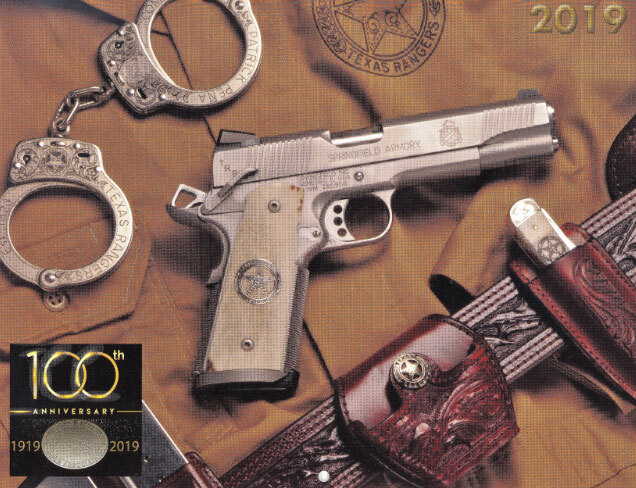 The Texas Ranger Hall of Fame and Museum, through an exclusive arrangement with the Texas Department of Corrections, obtains a limited number of these hand-crafted nickel-silver belt buckles. These are the actual buckles worn by many serving Texas Rangers. 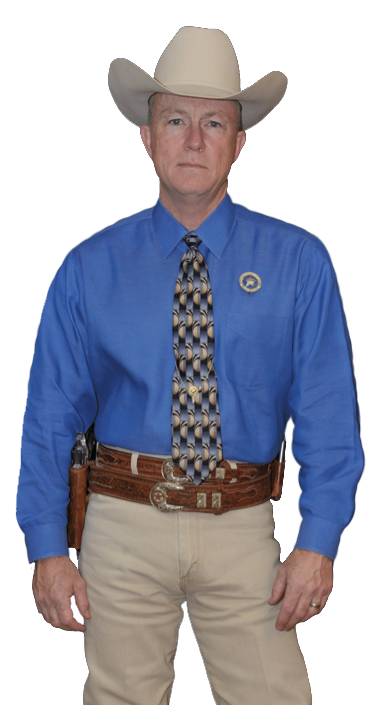 Chuck Norris ordered this same belt buckle for his television series Walker: Texas Ranger. Each buckle is hand made so minor variations are common. 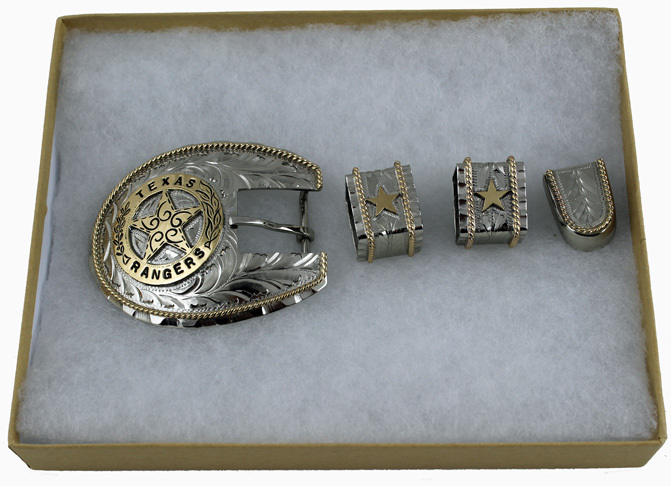 They feature a large Texas Ranger badge design, decorative chasing, twin nickle-silver belt retainers and belt end cap. The hardware is sized to fit a 3/4" width tongue. Prison shops run on an irregular schedule, so quantities are very limited. The scarcity and uncertainty of supply makes this a genuine collector's item. Supplied with a letter of authenticity from the Texas Ranger Hall of Fame and Museum. A waiting list is kept; please call for availability. Order early for the Holidays! 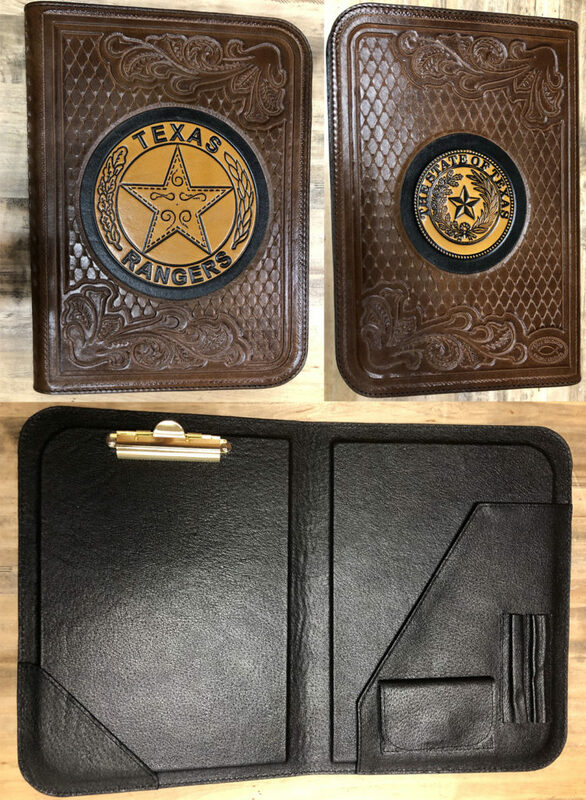 Hand-tooled leather Texas Ranger portfolio features badge on front and State seal on back. Made in the Texas Prison System. Stainless folding knife featuring Texas Rangers logo on handle.